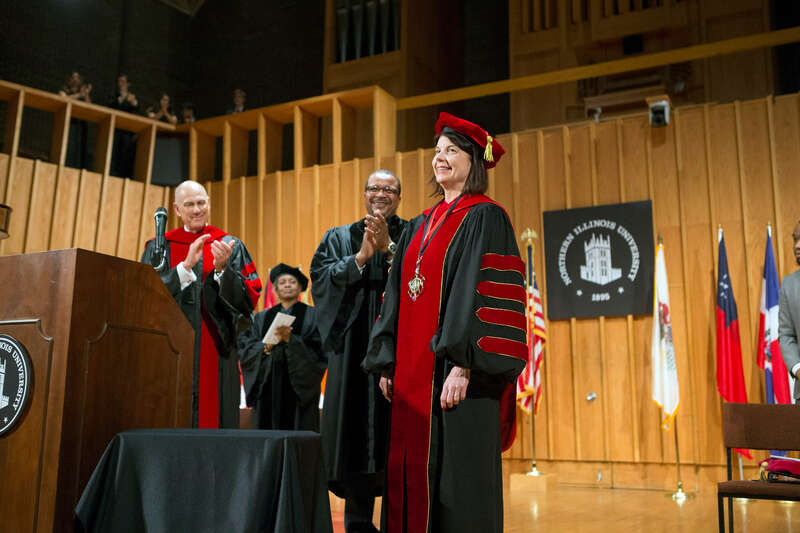 DeKalb, Ill. — Tradition and a forward-looking enthusiasm intertwined Friday as a community of proud Huskies celebrated the investiture of NIU President Lisa Freeman. Hundreds of students, faculty, staff, alumni and Huskies in spirit, including many of Dr. Freeman’s family, friends, mentors and colleagues, gathered for an afternoon of grandeur at Boutell Memorial Concert Hall to honor NIU’s 13th president – the first female president in the university’s nearly 125-year history. Since her days earning advanced degrees in biology and physiology and a Doctor of Veterinary Medicine from Cornell University, along with a Ph.D. in pharmacology from The Ohio State University – later working as a postdoctoral fellow and research scientist – Dr. Freeman has exhibited that Huskie grit she embraced upon arriving on campus in 2010. 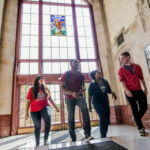 In her, students see someone fully engaged in their endeavors, said Khiree Cross, president of the Student Association. “The president is always there,” he said. Dr. Freeman first joined NIU as vice president of research and graduate studies, soon advancing to the position of executive vice president and provost. Appointed acting president in July of 2017, Dr. Freeman became president in September of 2018. 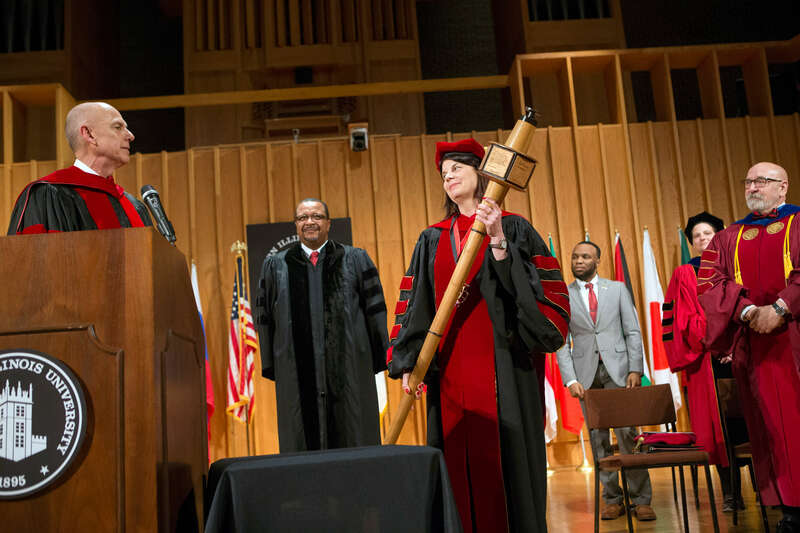 In historic measure Friday, a 14-karat yellow gold medallion and an intricately designed mahogany staff – known as a university mace – were bestowed upon the university’s leader by NIU Board of Trustees Chair Dennis Barsema and former chair Wheeler Coleman. Both items were first created and used more than 50 years ago at the inauguration of former President Rhoten Smith. At the time, President Smith challenged the university to focus on “excellence and opportunity,” Dr. Freeman told the crowd. Faculty, staff and colleagues spoke of Dr. Freeman’s innate leadership skills, inclusive decision-making, passion, integrity, vision and commitment to NIU. Her appointment as the first female president represents a monumental step at NIU, said alumnus Catherine Doederlein, Supportive Professional Staff Council president. She and alumna Holly Nicholson, Operating Staff Council president, described an engaged president with office hours for students, faculty, staff, alumni and community members to visit, someone who’s gotten up early on a snow day to deliver doughnuts to Operating Staff members clearing the grounds. Having first met Dr. Freeman 15 years ago as members of the Class of Fellows of the American Council of Education, J. Michael Durnil, Ph.D., reflected on Dr. Freeman’s wry wit and humility. “As I read your recently adopted set of values – of curiosity and creativity, of equity and inclusion, of ethics and integrity, and of service and stewardship – I gently smiled to myself that, in fact, your community has those all embodied in your leader. And, most importantly, Lisa will model those values as she works with all of you to create the future for NIU and maybe even more importantly those who come after her,” said Durnil, president and CEO of the Simon Youth Foundation. Through both her presence and words, Dr. Freeman “shows up,” said Katy Jaekel, Ph.D., assistant professor of Adult and Higher Education. As a member of the faculty senate and the Presidential Commission on Gender and Sexual Identity, as well as faculty adviser for the LGBTQ student organization, Prism, Jaekel asked members of each group what they would say about the president. They spoke of their sense of belonging on campus, Jaekel said, empowered by Dr. Freeman’s advocacy and support. She’s real. She listens. “In this way, President Freeman has let students know they matter, that their voices count,” Jaekel said. Dr. Freeman’s investiture attracted elected officials, including State Sen. Cristina Castro, D-Elgin; State Rep. Jeff Keicher, R-Sycamore; former State Rep. and Board of Trustees member Bob Pritchard; DeKalb County Board Member Steve Faivre; DeKalb Mayor Jerry Smith; and Sycamore Mayor Curt Lang. The day also drew those who’ve known Dr. Freeman since her own higher education journey began at Cornell University and continued into her years as associate vice president for innovation – and a devoted Wildcat – at Kansas State University. 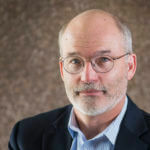 “I’ve never known anymore more likely or more capable of advancing through the ranks to become a university president than Lisa Freeman,” said Ronald Trewyn, Ph.D., the National Bio and Agro-Defense Facility liaison at Kansas State University. He and others lauded Dr. Freeman’s natural ability to lead and inspire. Dr. Freeman’s experience and expertise are broad and extensive, said Cherilyn Murer, a friend, NIU College of Law alumna and past chair of the Board of Trustees. “But what is most defining of Dr. Lisa Freeman is her integrity and vision,” added Murer, president and CEO of CGM Advisory Group LLC. Put simply, Board of Trustees Chair Barsema said, Dr. Freeman knows what it means to be a Huskie. 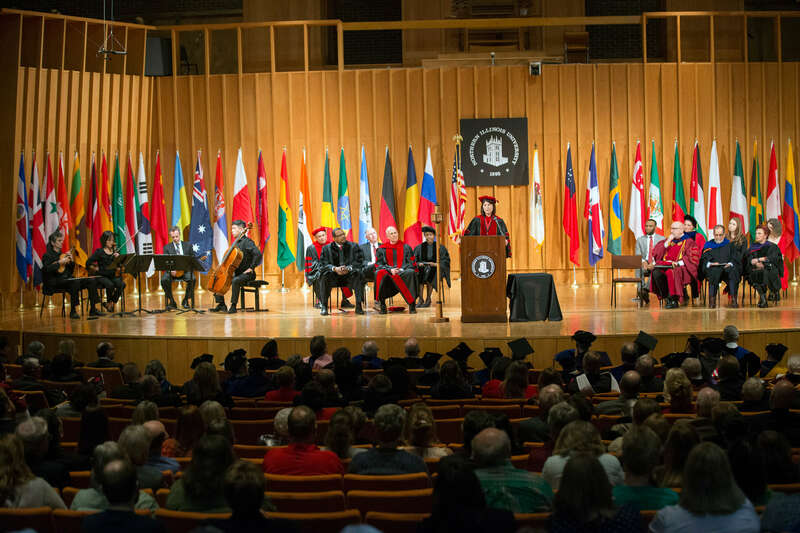 Other speakers at the ceremony included alumna Carol Crenshaw, who spoke on behalf of the NIU Foundation; and alumnus Peter Garrity, president of the NIU Alumni Association. In an effort to bring new life to the university mace bestowed upon her, President Freeman sought input from the NIU community to choose quotations that resonate today. The mace originally featured engraved quotations from ancient philosophers, writers and founding fathers. School of Art Professor James Obermeier and his students reconstructed the mace to include six sides, each bearing a quote.